On this day honoring the birth of Dr. Martin Luther King, Jr., we are reminded that his dream has not been achieved: not in society, not in education, not in the work force. A prime example is in a recent move by Tucson Unified School District to ban an important book on Native American education. The first atrocities of inequality and prejudice in America began with the indigenous people. 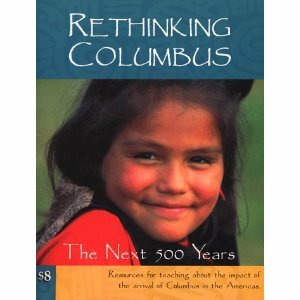 In one of my first years teaching, I was given a copy of Rethinking Columbus: The Next 500 Years: Resources for teaching about the impact of the arrival of Columbus in the Americas at a Native American art workshop. I immediately cherished this book as a tool that created balance with the state-adopted history textbook. I used it often. Thank goodness I was not a teacher in Tucson! It would seem that a Mexican American Studies program would be pretty important to Tucson. According to Fox News, the program violated the law, only served 1% of students, and was losing funding. The judge ruled that the program violated state law by having one or more classes designed primarily for one ethnic group, promoting racial resentment and advocating ethnic solidarity instead of treating students as individuals. I can understand if the program is ending because of these reasons, and frankly, this information should be integrated into all of the students’ education rather than taught separately, yet banning a book has nothing to do with budget cuts. It is purely a move of censorship. This book does not violate any laws, but oh yea, free speech has no place in education. Your an obvious racists, that program was racist! That program was just as bad as if it wete a Nazi program!! Obviously, you portray traits of racism in that statement. Let me guess, are you Caucasian? Are you part of the dominant society that does not see inequality? The education system, according to your statement, can be racist. The educational system is Eurocentric. Even history, the sciences, English classes that are held in school districts, such as Tuscon, are heavily Eurocentic, which is usually seen by the eyes of dominant society. You say that this program is racist, and it is not. If you try to attack the program as biased, what isn’t? Who creates or establishes the notion of what is “normal” or “non-racist”? This program is not promoting the superiority of ONE race, but helps others see the world in the eyes of others. This programs helps eliminate ignorance in our society. Be open minded. But I guess that is too much to ask for. No wonder why our country is going down in terms of education. No wonder why there are so much crimes that are based on the notion of race. Thanks for displaying that. Well said,Tonya. I learned years ago that the History I was being taught from textbooks was pure white washed bunk. I loved History and read many books about History as a student in public school. It began to dawn on me that the books I read outside of History class contradicted with what I was being taught in class. When I brought this up to my 10th grade History teacher while studying the Vietnam conflict she asked me “Well,what does your text book say?” I told her “I see what the text book says but writer( a,b,c,etc) said ……..” She then told me “Just learn what your textbook says.” I was floored! Obviously this teacher even knew the textbook was not telling the entire truth but she still expected the class to merely learn,memorize and regurgitate falsehoods. Reason number one million and one why I home educate my son. I couldn’t believe that book was banned until I read the location. Arizona has some serious problems in their educational system regarding ethnic studies. I liked how you connected it to it being MLK, Jr day today and how the equality he dreamed of still hasn’t been achieved. I think lots of the time as children we get tricked into thinking that the civil rights movement has passed and that it was something only in history books. We still fight issues today that are parallel to the ones fought back then, but the discrimination is different these days. Sigh, the book was not banned, it is still available in the schools libraries. It along with other books will no longer be part of the curriculum. Teachers are still free to use it as a resource. This is whole banned book issue is a sour grapes propaganda tactic by the Marxist creators of the MAS program. As a home education parent I feel that this is a necessary book for parents who wish their children to have a truly liberal education. This is a must have book for my son’s home education library.I want my son to always hear both sides of a story,not just one side. I strongly feel that Thoreau would have lauded this book. And for those who don’t know,there is a difference between “liberal” in the political sense and “liberal” in the educational sense. For those in doubt,please feel free to read the 1961 essay “The Marks of an Educated Man” by Alan Simpson.